OMG! Did you just shoot the learner? What did you do? Did you misfire a bullet? Or did you pump in too many bullets? Be careful. The bullet is a powerful weapon. You must use it wisely to create the right "impact." We are talking eLearning here. And the bullets are those little black dots that instructional designers are either obsessed with or hate with a vengeance. The former breed litters their courses with bullet lists—an overkill. The latter group avoids bullets like the plague; they probably do not know how bullet lists make learning matter more comprehensible. Bullet lists help to structure ideas and present them in bite-sized chunks that are easy for the learner to skim over. Bullets are like mini headlines. The ideal bullet item is a crisp phrase that presents just the essence of an idea; it is not a rambling sentence that makes the learner trail off midway. 1. Know when to use bullet lists. Without a doubt, this is the biggest lesson in using bullet lists. Not all types of content lend well to bullet lists. For instance, a series of steps that have to be carried out in a definite sequence has to be represented in a numbered list. But a story that relies on the flow of words and ideas to convey drama and emotional highs and lows cannot be presented in a bullet list. While mulling over whether or not to create a bullet list out of a chunk of information, keep this golden rule in mind: if the learner HAS to know this information, then it better be in the form of bullets. Chunk content carefully to determine the most critical pieces of information. Present only these bits of information in bullet lists. Do not create long lists with a seemingly endless number of items. It may be a bullet list, but it is still a lot of information for the learner to read and make sense of in one go. Make each bullet item short and crisp. Wherever possible, use phrases instead of sentences. Think of bullet points like a “mini headline”. If you have to use sentences, make sure each item is no longer than three lines. 3. Order items to make the list easy to remember. Bullet lists are naturally attention-grabbing. But in this age of micro blogs and one-liner social media updates, the learner still tends to trail off somewhere in the middle of the list. Most learners are attentive while reading the first and the last few items of a bullet list. Unless your list has items that have to be presented in a specific sequence, place the most critical pieces of information towards the start and end of the list. This ensures learners do not miss important information. Create coherent bullet lists where every item is connected to the idea contained in the lead-text. So if your lead-in text reads, "The following are the features of this device," every item on the list should be a word or a phrase that indicates a characteristic of the device in question. Maintain consistency in the length of the items in the list. If all the items contain 2-3 lines each, do not plunk down a single word or a short phrase as an item and leave without explaining it. Add space between the paragraphs nestled between the bullets. You can also carve out some space between the bullets and increase the size to make the bullet items look like separate paragraphs while still ensuring they stand out on the screen. 6. Go visual wherever possible. Lists (read: lines of text stacked one on top of the other) tend to get boring after a few screens. Besides, we are visual creatures; pictures and icons always excite us and compel us to pay attention. You can get visually creative with bullet lists as well. Use graphic elements like arrows or check-boxes instead of the regular (dull) black dot as bullets. Use icons to add emphasis to the list item. You can then use these icons elsewhere in the course to create a visual theme. Use color and font size to highlight the most important part. Nestle every item inside a shape and add numbers, headers, or icons to each. You can arrange the shapes horizontally or vertically to create visual interest. 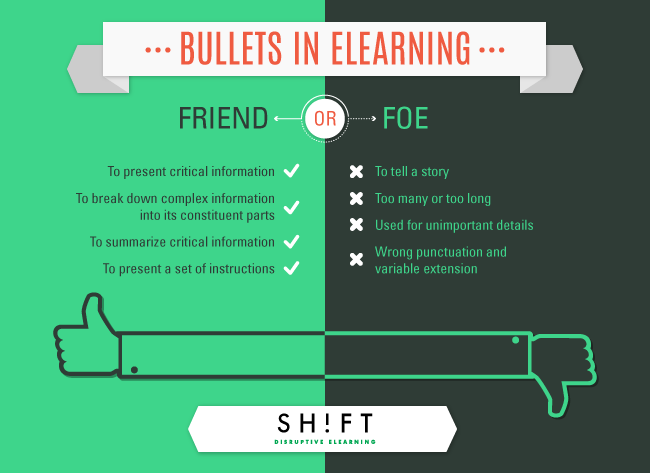 Bullets, in eLearning, exemplify a classic case of "Give a dog a bad name and hang him." They are abused by over-enthusiastic and lazy (Yes, bullets are convenient!) instructional designers, and the shoddy results then scare off others. But bullet lists are powerful means of expressing and explaining instructional content. If you can use these wisely, you can enhance the value of your courses.